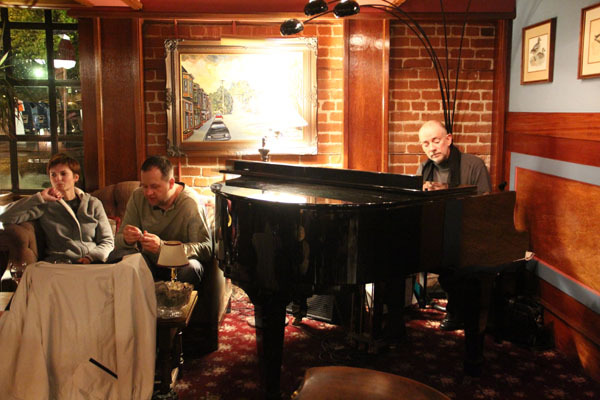 The Hotel Mac Lounge has been newly refurbished with a well-tuned grand piano! Don’t be surprised when you walk into our warm, inviting lounge to sometimes hear a little acoustic jazz emanating from our well-appointed lounge and bar area. A perfect location any time of day to meet that special someone, or to take a short break from your busy day. The Hotel Mac lounge is known world-wide as a romantic locale for fresh oysters and martinis. Gaze out at the picturesque small-town vibe of historic Point Richmond as you sip your glass of Meritage or aged Cognac. While the lounge is often bustling, on evenings and weekends it is highly regarded as a regional ‘hot spot’ for great conversation and making new friends. We encourage all dinner guests to arrive ahead of your reservation long enough to enjoy a few transitional minutes unwinding in the lounge before continuing on to your reserved table. You will be glad you did!